This week, we’re taking you to the cutting edge of materials science including how blacksmiths made incredibly tough swords to how defence scientists make bullet-proof armour today. Plus, news of a better way to manage prostate cancer, how fingerprints might replace chip n pin, and how scientists are using cold lightning to keep fruit fresh for longer. Every year, tens of thousands of men are diagnosed with prostate cancer. But what should they do? Every year, tens of thousands of men are diagnosed with cancer of the prostate, the gland that sits at the base of the bladder. But what should they do about their condition? Should they elect to have radiotherapy, or surgery, and risk the side effects of the treatment? Or should they instead choose just to monitor the disease and treat any symptoms as they occur, because - in their case - they’re actually more likely to die of some other disease before the prostate cancer actually causes a problem? Vincent - My name is Vincent Gnanapragasam I'm a consultant urologist in the University of Cambridge. We have produced a new tool that will help men newly diagnosed with prostate cancer to decide whether or not treatment is right for them and to help them make decisions whether these treatments are going to benefit or whether or not they won't. Prostate cancer is a very common disease, and as we men get older that is a disease which is almost inevitable in some cases. But not all prostate cancers will go on to cause problems or indeed result in cancer-related death. In fact, you're more likely to live with it than to die from it. So we set out to understand what are the attributes of these cancers which we can actually identify which informs an individual when they’re newly diagnosed about whether or not they need treatment up front. Chris - When we are considering prostate cancer, how many cases are there in a country of the sort of size of the UK and our population demographic at the moment? Vincent - Well, at the moment, we are diagnosing approximately 40,000 men with prostate cancer every year, and we know that the data projections are that by 30 years time we are actually going to be diagnosing about 70% more. We’re also getting much better at picking it up, and picking it up at an early stage, and all of this is going to result in many men being diagnosed with prostate cancer and potentially living with their diagnosis. Chris - One of the questions that always goes with a screening programme is if we look for something we've got to be able to do something about the thing we are looking for and do something about it in a good way. So do you know that when we do intervene in prostate cancer we are actually improving the prognosis for that person? We’re not just labelling someone now you've got prostate cancer, now you live with all these side-effects we've inflicted on you, but actually we've not really changed the outcome of that person; they're not gonna live any longer? Vincent - So that is at the heart of the Predict Prostate tool. The key point is what do you do with a new diagnosis, and Predict Prostate was constructed to actually help an individual understand that if you have a new diagnosis you may need treatment because you can see clear benefits from that, but in some cases you may not see a huge benefit from that. 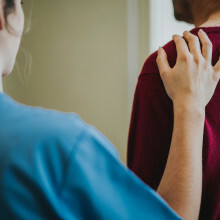 And it also then gives confidence, we hope, that they can live with that slow-growing indolent cancer which is unlikely to cause a problem, but they can know that with a little bit more surety than just by being told by someone that that's the case. Chris - How did you design this model or how did you create this? Vincent - We took a population dataset from the East of England of 10,000 men and we used statistical models which had been developed by our collaborators to actually construct the model. And then we re-tested it in a cohort from Singapore which is ethnically different and showed that the model actually proves to be quite accurate in that setting as well. Chris - So what factors specifically about an individual if someone walks into your clinic can you make measurements? What factors are you considering so that the model can make these predictions? Chris - That's Prostate Specific Antigen, that’s a blood marker that can indicate something is up with the prostate, can't it? Vincent - You're absolutely correct. And that is used as a detection test but actually the level also has some value in predicting outcome. Then we look at this stage, how extensive is the cancer, and what the sample showed when we took the biopsy or piece of the prostate, and how many of those biopsies are positive. Those in the essential elements and they are available in any standard consultation. We were amazed actually by how powerful just those simple factors could be if put together in the right way. Chris - So you are saying you take those measurements and you can make prediction of what exactly with those numbers? Vincent - So what the model is telling you is what the impact of these factors are on someone's overall risk of dying. And so the model tells an individual what the 10 and 15 year survival chances are with and without treatment measured against that. Chris - Do you think on the basis of being in this position now with a much more powerful tool that we now have in the form of models like yours that we should be pushing for some kind of screening programme for prostate cancer? Because we have screening programmes for breast cancer, we have screening programmes for cervical cancer and they're very effective, but the numbers of people afflicted with those conditions are very low compared to the numbers that you've been saying are affected by prostate cancer. So at what point do you think we need to start well we need to do something about this? Vincent - So the paradigm needs to shift. Screening is all about saving lives, so effectively if you look at the mantra about screening you have to show that an intervention improves survival. And so you have this problem with overtreatment which is why people don't want to screen for prostate cancer. So I think that if there is an acceptance that you can pick up lots of cancers which don't need treatment, but which you can monitor and that becomes okay, then I think screening programme will become effective. Helena - Cone snails are all predatory marine snails so they prey on either worms, snails or even fish, and they’re native to the tropics so they live in beautiful areas. They have wonderful shells; there are about 800 different species and every single species has a different shell pattern and they're all very beautiful. But we are most interested in the compounds these snails make to prey on other animals, and we've long known they produce compounds that can be used in pain relief and pain research. But what we have now found is that some of these species actually make insulin, and they release that insulin into the water that the fish is swimming in and that insulin causes blood sugar to quickly drop, and the fish that is exposed to the insulin is not able to swim away anymore. Chris - And the cone snail snaps it up and eats it? Helena - And once the fish is unable to swim away, the cone snail comes and can just swallow it up. Chris - That's extraordinary to think that this thing is squirting insulin into the water. 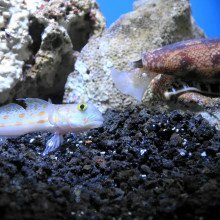 So to questions spring to mind 1) why doesn't the cone snail end up with very low blood sugar as well or doesn't insulin work in a cone snail, and 2) how does the insulin get out of the water and into the fish? 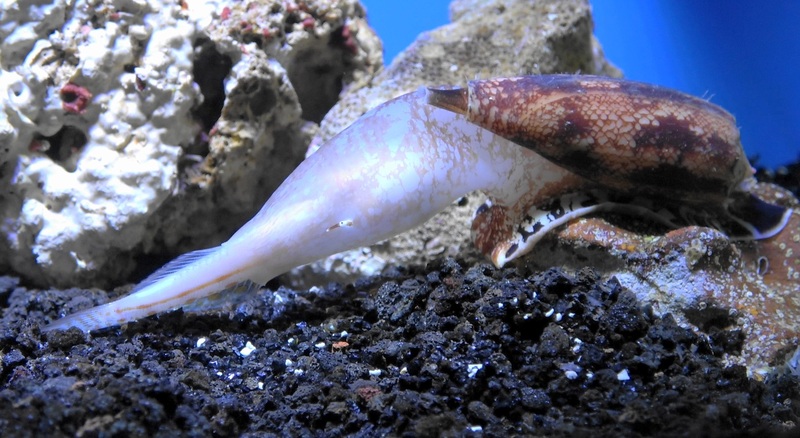 Helena - It turns out that the insulin the cone snail makes is very different to its own insulin. So the snail makes its own insulin to regulate sugar levels in its own body but the insulin that it sprays into the water is extremely similar to the insulin produced by a fish so it wouldn't be active at its own target receptor. In terms of how it gets into the fish, we think it rapidly enters the body through the gills. Chris - The thing is though, if you did this with the kinds of insulin that we have in the clinic to give to to humans, they’re quite slow acting aren't they? Whereas a venom has to work really fast in order to immobilise a prey really fast because these things are shellfish, they wouldn't be able to pursue a fast-moving fish, so this stuff must be quick? How does it do it? Helena - The snail has to make sure that the fish is very rapidly immobilised and the insulin acts very rapidly compared to the insulin that we make and it does that by being a single compound. Our human insulin is very sticky so an individual insulin would stick very rapidly to another insulin and to another insulin and form so-called hexamers. And the snail insulin, because it has to act very rapidly, never forms a hexamer so it can act much faster than our own insulins do. Chris - So when our insulins go into the body do they have to unstick before they can work then, whereas what the snails are doing, is theirs never stick in the first place so they're immediately available for action? Helena - Yes, that's exactly right. When we inject, or a diabetic patient injects insulin into the body the hexamer has to first associate into a compound that can then be active, whereas the snail never made the hexamer in the first place so it's immediately active. Chris - Now if you know this, the obvious question to ask is well why don't we just make with our biotechnology know-how a form of human insulin which can't stick together like that? Helena - That's a very interesting question. We have actually tried to do this for over 20 years now and we have not solved this problem because at the moment you try to make the human insulin not stick, it's not active anymore so you strip it of its activity so you can still inject it, but it won't do anything in your body anymore. Somehow the snails have solved this long-standing problem by making this insulin in its venom. Chris - So put me out of my misery; what has the snail been able to do that human industry over the last couple of decades couldn't? It must have discovered some kind of clever trick that we hadn't thought of? Helena - Yes. So we think that the snail insulin binds to the human insulin receptor or the fish insulin receptor in a different fashion. It uses a slightly different surface on the receptor so the area that it uses to bind to the receptor is a little different to our human insulin, and this is how the snail has solved this. Chris - But critically, what that means is that if you can copy what the snail does you could potentially make a human insulin that's very fast acting and not sticky in that way so when it went into the human it would very quickly gain control of their blood sugar? Helena - Yes, and that's exactly what we are currently trying to do, and we have made very good progress on this that we're planning to hopefully publish soon in the future. So what we’ve done is to try to learn as much as we can from the snail insulins, the different ones that we have found, and then go back to human insulin and make it non-sticky and yet active. And we have the first compound that we are hoping to put into the clinic sometime in the future. Are you someone who’s forgotten the pin for your credit or debit card with the usual embarrassing and inconvenient consequences? Thankfully, those days may soon be behind you. Because a card with a built-in fingerprint scanner is on the way. Izzie Clarke asked Angel Investor Peter Cowley to explain who's behind this work. Peter - It's actually a company you probably haven't heard of because these products like this are all done by companies you hear with the consumer. It's a company called Gemalto, a Dutch company, a couple of billion turnover. Quite a big company and they're just introducing this initially as tech and trialling it. Izzie - Where are we hoping we might be able to see this? Peter - Well, they've trialled it in several places round the world but it's been announced that RBS and NatWest are trialling it just with 200 people just for three months. Izzie - Okay. So not too many then! How does this actually work? Peter - It's basically a card as I’ve got one in my hand and it's got a chip on it. You can't use it contactless because you need the power to run the fingerprint detector. So you're putting the card into the reader so then the power comes through from the reader itself and instead of putting your pin in, you've got your finger or thumb over the reader at the same time. So what they've done is to actually get into the card which is much less than 1 mm thick. The idea behind it is that you're using your fingerprint or your thumbprint instead of a pin. Now the advantage of that is that pins are obviously forgotten, as you say. My late father used keep his pin attached to his card - it's not a good idea. And also that the pin itself, you're probably not aware but the pin can be stored on the card but it also can be stored remotely so there's a possibility the pin can be intercepted. Whereas the fingerprint will be stored purely on the card in the same way as it is on your phone if you've got a fingerprint recognition on your phone. Izzie - How secure is this though? Peter - Well, this is a good question. In fact, I don't know if you're aware - Chris might be aware - that even identical twins do not have the same fingerprint. And it turns out it's because a level of nurture rather than nature i.e how long the umbilical cord is even, whether that fingerprint changes. So we are all unique, basically. Chris - I was just going to ask you how the fingerprint scanner works because there are several ways to scan fingerprints, aren't there? There's just the mundane way of taking a picture which is pretty easy to fool, and then there's the way that most phones work which is they're measuring the electrical capacitance. But then there's this newfangled way which is it stores an ultrasonic measurement of the fingertip which is much hard to dupe, so which of these is it? Peter - I suspect, and there's no technical information on the net about this, but I would suspect that it’s the capacitance one, because you got to get into such a small space. This is 0.75 mm so that's got to have both the reader and all the electronics behind it and all the wiring etc. So security, yes, it's likely to be much more secure than a pin. Izzie - And, you know, cost-effective? How much does it add to the cost, say, of operating a card? Peter - Again, they don't know yet because these are really small trials. But if you take a standard card it's about 10 or 20 cents to manufacture in big volumes. If you take it with a chip in as well it's 1 to 2 dollars, so it's going to be more than that. But the cost of actually distributing the card and the pin and everything else by the bank to people like us is a multiple again, so the card cost is likely to be more. It comes down to whether it's worth it for somebody. Now is it for the people who forget their pins or perhaps have some sort of issue with remembering pins. Chris, do you remember your pin? Chris - I struggle because of I’ve got so many cards. Like passwords, because we’ve got to the point now where we've made passwords so uber complicated with 15 different types of special character, plus a number, plus a capital letter, a lock of your mother's hair and a DNA sample all wound into your password. You can't remember any of them so what do you do, you write them down. But the point I was going to make about cards, is this fingerprint business a sort of solution to a problem that we really haven't got any more because are cards are really going to be around? 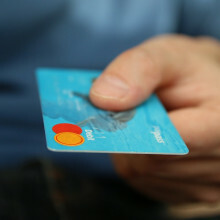 Do you see a long term future for cards because everyone is paying with phones and things? Peter - Exactly. In fact, as you know, on the this program before I have an Apple watch and and because Apple have done a deal, in the same way that Google will have done a deal, I can spend several hundred pounds on my wrist. I use cash probably once every five or six weeks. I use my card only when it's, say, in one of the big supermarkets round here I will get stuck at £30 limit otherwise I don't. I think it's more going to be used by people who do have a problem with remembering pins so I think that will actually work. But how big is that subset of the population? And if it's related to age, they obviously get old and use less so if you take the sort of millennial going through, it may not be needed. So I think, it's probably and may be very unfair on the manufacturer, properly a piece of tech they’re trying to see if there's a market. Izzie - And you said that it's going to be a small trial, so when is this coming and where? Peter - It's coming in the next 2 or 3 weeks I think in the UK, but that it has been trialled around the world so they're obviously trialling it out. The tech probably works, it’s whether the market i.e. us want to adopt it. Kirsty - The FAO (Food and Agricultural Organisation) say that globally 30% of all food is lost or wasted, which is equivalent to 1.3 billion tons. And a large part of that occurs at what we call the post-harvest stage, so it's after it's left the farm and before it reaches the consumer, or even at the stage of the consumer. Chris - Some figures I've seen suggest that even in households people are buying stuff, they put it in the fridge and then they just grow it as a mould culture and then they just put in the bin. I mean a lot of that waste actually happens because people overbuy. Kirsty - That's exactly it. A produce like avocados, people take them home, they turn black, they go ‘oh I'm not eating that’ and they throw it in the bin. Same with strawberries, you have them for a couple of days, they start to grow that grey fluff... ‘oh I'm not eating that’, gets thrown in the bin. So that's what we wanted to address, how do we actually stop that mould growing and reduce the amount of food waste that's occurring. So we've developed a technology which we call cold plasma or cold lightning and actually stops that mould occurring. Chris - How does it work? Kirsty - Cold plasma is an ionised gas. If you think back to your high school science days it's the fourth state of matter and we produce it by applying an electrical current to a gas. The gas that we use is just the air that we breathe and when we produce the plasma it leaves a coating over the surface of the fruit vegetables. So it's little reactive ions, electrons, reactive oxygen and nitrogen species, and all of those things together are anti microbial so they actually stop the spores that are in the mould from germinating, and if they don't germinate they can't infect the food. Chris - So you basically apply a strong electric field to some air, strip off the electrons from some of the molecules that are in there so you end up with this plasma? This then, you pass that over the food, it decorates the surface of the food and and then you've protected the surface so that if there is anything resident on there from the air - fungus, bacteria, whatever, it will killed? Kirsty - That's right. So all those little electrons and ions and things that are produced in the plasma, they directly attack any mould that is on that food. And it can be mould, so that's the fungal pathogens, but it can also be bacteria and also viruses as well. Chris - Why does it attack the microbes but it doesn't attack the food? Kirsty - Yeah, that's interesting. That's the real science behind it so that's something that we want to look into. 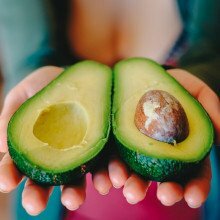 We actually do think it has an effect on the food, particularly on fresh produce and we actually think what it might be doing is boosting the immune response of the fruit and vegetables so there's actually a two-fold effect there. So that's one of the stages of research that we’d like to do next, to actually look at the science behind that and confirm that theory. Chris - And it doesn't actually affect the flavour, and it doesn't affect the integrity or the safety of the food item? Kirsty - No, that's correct. We've had in our lab avocados, strawberries, we’re doing mangoes, citrus and corn at the moment. After we've treated them we have row of students lining up to test these - students always like free food - but it hasn't change the taste. We've also looked things like the firmness of the fruit so we look at whether it's softening or anything like that, but is all unaffected. The colour doesn't change, the weight of the fruit doesn't change either. So that's a major benefit, it's not impacting on the actual quality or taste of the fruit either. Chris - So if I took an average strawberry or an average avocado, both of which I love very much, but also does the fungus trying to grow in my fridge based on what I threw away last week, how much longer would that last in my fridge after it's been treated via your technique compared with if I just took the same batch of strawberries and put them straight in my refrigerator? Kirsty - Okay. So avocados have been our biggest achievement. When we've treated avocados with plasma normally they would last about five days if you're lucky. We've had them about three weeks old and they're still nice and fresh. There's a bit of variation there but to extend that shelf life by three weeks is a huge achievement and the growers are really excited about that. Chris - I'm not surprised because, of course, that means they're going to a lot more produce isn't it? I mean, in financial terms, how much do you think you can save the market? Kirsty - Yeah, there hasn't actually been a lot done on that. But there is a figure that says for every dollar spent on reducing food waste there is a fourteen-fold return. So that’s in general for whatever treatment it is, so that's sort of what we're hoping to achieve by doing it with plasma. Chris - Now is this scalable, because when you've got literally millions of tonnes of food flowing to consumers, is it feasible to subject it to plasma treatment using the technique you've developed? Kirsty - In the next six months what we want to do is to test it in the pack house. We’re working with a local avocado grower and we're going to go into his pack house and look at where we can apply it on the conveyor belt. So as the avocados come in out of the orchard we are looking at can we apply the plasma across the conveyor belt, or do we even apply it in water when they washed the avocados. So that will confirm that we can actually scale it up out of the lab. There's no reason why it won't work, we're just going to confirm it. Jack - Swords and armour were our best friend for thousands of years, both weapons of war and means to protect families and possessions. And though we may not use swords any longer modern armour and blades are still very relevant and they were all made with steel, a metal that can be shaped into almost anything. Magnus - Iron is incredibly difficult to harden. If you turn it into steel, which is just actually iron and carbon, and yet you can vary the amount carbon and the different types of heat process, it can be used for most things from making cooking pots to decent blades to suits of armour. The other thing is, of course, iron ore’s a lot more common than copper and tin so it easier, it's more available, it’s more out there. Jack - A lot of positives to using steel then. But it's reliant on the carbon content within the iron to make it hard. To understand how carbon does this, imagine a cup of tea and adding a sugar cube, creating a solution where the sugar particles are evenly dissolved throughout. The carbon in the steel is just like the sugar in the tea, the carbon fits in the gaps of the iron's crystal structure preventing the crystals from moving and increasing the hardness of the whole material. Magnus - It’s difficult in that time because of the smelting process to get good quality steel that's high carbon content all the way through a homogenous piece of steel with good quality carbon all the way through - evenly dispersed. So you can control it to a limited extent on a charcoal powered forge by just heating it through and stacking it. You get to a temperature before the carbon is burnt out but that it will absorb carbon. If it's in basically a stack with almost no oxygen, at the right temperature it will absorb the carbon before it burns it out. Jack - So that's the point, you bury it in all this charcoal? Magnus - Yep. You heat it up nice and slowly. Jack - All the carbon transfers and then that's what gives you that hardness that you're looking for? Magnus - Yeah. I mean this is the way that they would have done it, you know, through the Medieval period. Jack - The forge was already lit, so we stoked up the heat using bellows that filled an entire room next door to blow air through the fire and crank up the flames until they glowed a bright bluey purple colour. Magnus buried our bar of steel into the ferocious charcoal fire at 1,300 degrees celsius. Temperatures this high cause the steel to glow bright orange and become soft so that it can be worked into the shape of our blade. He pulled it out of the fire and started beating it with a hammer over his anvil - that's right, that large chunk of metal often dropped from the sky in the cartoons, and this continuous bashing has a lot of benefits. Magnus - It’s moving it into a different shape. It's also refining the structure of the steel as you work it, so it's making the structure finer so you're actually improving the quality of the steel. What you're doing here is making the crystals smaller and finer so you've got a small and finer grained structure. You're also working by the feel of the metal and the sound. If I hit where it's colder it rings more, if I hit where it's hotter - a duller sound. So you can actually feel by how it's responding, how it's working. Everybody thinks it's actually the hammer that's doing a lot of the work but you're actually using the anvil to keep the surface smooth and get rid of the hammer marks. As you can see now it's really lost colour very very quickly. If the steel got a fair amount of carbon in you don't want to work it cold, it will crack the steel. Jack - And so, it was back into the flames of the forge, then reheat the steel, bash it some more and essentially repeat the process until you've got a sharp edge. Magnus - We prefer to refine most of it on the forge, and in the forge on the anvil and not grind it because again, I'm not wasting steel, which they wouldn't have done years and years ago because steel was way too expensive to just grind most of it off. And I feel we get a better quality product; as I said you refining the structure of the steel all the way through so why just grind most of it away. Jack - how do they know how to make all these different materials? Magnus - Trial, error, inspired guesswork. At the time they weren't sticking all this under an electron microscope and looking at the structure and things like that, and what they found worked they stuck with. And there were rituals that each blacksmith; he'd have water or his brine at a certain temperature because that worked for him and everything else. I mean if he had an amazing day and did everything perfectly well and he tripped over the step coming into the forge that morning, he would then try and make that part of the ritual. We know in a lot of cases, they carried on using processes where only one bit of the process gave them what they wanted, but because they discovered it by using the other processes, they kept the other processes in. I mean how was iron, bronze first produced? It wasn't a bunch of people sitting by a campfire and noticing that they'd melted metal. So you start off with a copper period; copper's mined very closely to arsenic. If you've got any arsenic in the smelt with the copper, you get bronze. The first bronzes were not copper and tin, they were copper and arsenic which was really good for everybody! Jack - Hmm, maybe not! Poison aside, it was then time to dunk our blade into some water, otherwise known as quenching. Magnus - What this has done is suddenly caused all the vibrating particles to actually lock solid. You're trying to get hard and tough. You get hard it snaps, tough is slightly softer so you actually run through several heat cycles to actually get the effect you want. And it's called tempering where you heat it up, quench it, and let heat back into the blade. And different heats and tempering processes give you different qualities in different types of steel. Jack - Okay. So you trying to make, I guess, a hard edge on the blade but not so that it snaps like a ruler or something? Very easy if you bend it to much it breaks, you wouldn't want that on the battlefield? Magnus - No, it's a fine line. You've got to work out what you need for what we’d call a working edge. You know, what is this tool or weapon going to be used for and use a heat process that will give you, if not exactly what you want, as close as physically possible can the achieved with the materials you've got. Jess - Yeah, it's kind of a bizarre pair of 3D printed pliers. I would say I seem to have deformed with my enthusiasm to play with it. Izzie - They were functioning earlier. It's almost as if someone's done an outline of traditional pliers but actually it’s all one bit; there's no screws in there whatsoever. Jess - Exactly. It’s something called Computer Aided Design. 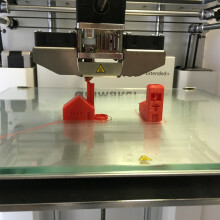 So you draw out your structure on a computer and you basically print it like you print at home anyway, but instead of an ink cartridge you’ve got a plastic filament, and then you direct that onto some kind of substrate and you end up with this 3D printed form of pliers. And, as you mention, you can impart a huge amount of strength by being clever about the way that you design it, clever about the way that you print it so the kind of axis that you printed along, and clever about these funny little structures that you have inside it kind of give it the extra strength. Maybe a kind of honeycomb structure on the inside so that it's more robust. Izzie - So a usual pair of pliers; you've almost got two bits of metal and right in the middle you've got a screw and that's what gives it their functionality. Here, where you would expect a screw we've got this nice little mesh which is different from the structure of the rest of the printed material and that's what's actually able to make it move in the way that we would expect it to? Jess - Exactly. So you just have to be a bit clever in the way that you design it so you can impart the functionality later, but I guess that's where we're going with materials now in general. We're thinking much more about the way that we fabricate them and engineer them to give them some special properties that they didn't have before. Izzie - Why is it so different to be using the structure and shape of materials in this way? Jess - Because I think for a long time, and certainly coming off the back of that description that we have before thinking about the way that we used to make swords and everything like that, we had materials and we took them and made them smaller. 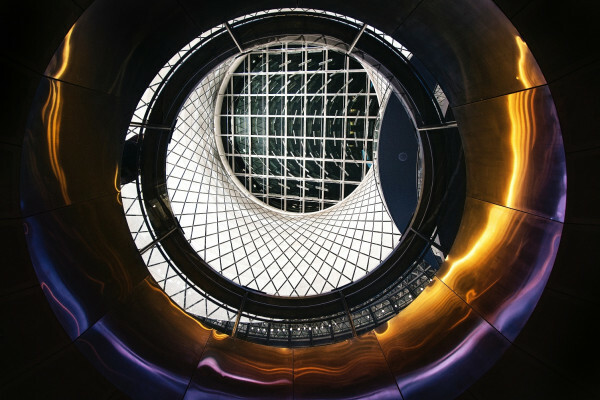 We went from the top and work down, and now we can go from the bottom and work upwards and we can really think about what functionality we want that material to have and then design it at a really atomic level to give it those properties. So the kind of fantastic, mysterious, science-fiction ones are these metamaterials where you can create structures where the spacing between individual elements is less than the wavelength of a light that you want to look at. And when you do that you can give it these really bizarre physics properties where you can start playing, not only with with the electric field of the lightwave that we usually play around with with the normal material, but also the magnetic fields. So you can do such crazy things if you engineer at such a tiny scale that actually it's really exciting, both as a challenge for physicists but also in thinking about the ways that we can use them in modern life. And I think now that materials, in general, whether it's something for physics, and maybe people who listen to this radio programme have heard of this idea of optical cloaking and invisibility cloaks. But now people are thinking about the way we could put it into the materials that we use everyday so going towards wearable technology but much more thinking about the functionality of fabrics and I think that's really exciting area of science too. Izzie - Now you sort of threw that in there - an invisibility cloak. We started off with a pair of pliers so this is obviously looking at that structure. So what are some of those new applications of new materials are closely linked to their structure? Jess - The invisibility cloak is an interesting one right. This is where you are taking individual elements and spacing them, like I said, less than the wavelength of light. And when you create these kind of structures you can have materials that don't just do the normal things we used to like absorb and reflect light. We’re happy with that, that's what most things do; that's how we see that they're there, but you can actually have materials that actually force light to bend around that structure. And this is the idea of the invisibility cloak that if you had the right spacing in the material that you fabricated, light would be kind of navigated around the edges of whatever you’d created so that you be able to see as if it wasn't there, as if you just looking straight through it. The application's not only Harry Potter style, but are also ones you could use it surgery to able to let people see beyond an organ or something like that and see around it. I think the more exciting ones for me are the ones where people are, I mentioned it a bit that embedding them into clothing. I met an incredible designer who is at the Royal College of Art and the Helen Hamlyn Centre of Design, and she's called Laura Salisbury, and she's creating this knitwear that is designed to rehabilitate people who have suffered from stroke. So it's designed to stimulate things inside your arms or where ever you need it, so that you can rehab faster, and I just think that's the neatest thing ever. I also met a phenomenal researcher from South Korea called Mi Jung Lee who is looking at ways that you can create memory from woven fabric. So you have each piece of thread as if it's an electrode and you can create kind of volatile memory systems, which is just incredible. Izzie - Oh my goodness! Jess - So it's taking materials that we can now impart some functionality into in a flexible way and it's saying this is what we been doing for a really long time. And, actually, we can solve new problems now with these materials, and I think it's so exciting. Izzie - Is this the future then of wearable material technology? I mean, how close is it to reality and how soon could be seen things like this? Jess - I think we are completely there, at reality. I think right now it’s pretty niche to take these materials whether it's for sports rehab or because you want to have some kind of memory system in your shirt sleeve. But I think we’re completely there scientifically and we just need a better interaction with designers and scientists to make it happen completely everyday. Harry - Making something like this takes enormous individual skill. The skills would have been developed for generations really, but this is made from a single material. This would be steel and it would have a carbon concentration, perhaps about 0.58%. Jack - Is that a lot of carbon? Harry - It's a lot of carbon compared with say structural steels because this does not need to be joined. If you put too much carbon you can't actually weld the material. This will contain millions and millions of crystals, with carbon being forced into those crystals by this rapid cooling. Jack - And that's what traps them in? Harry - That's what traps them in. 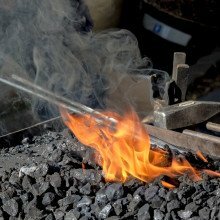 Jack - It's only in the modern era that we've come to understand why the techniques the blacksmiths have developed over thousands of years actually work. It’s all to do with how the atoms in the material are arranged and what other atoms are present too. In the case of steel in our sword blade a smattering of carbon atoms in the right places makes the material much stronger than the iron on its own. But rather than just understanding the properties of a materials we have already, metallurgists like Harry are also trying to design new, even more resilient materials by modelling the all-important crystal structure of the metal in a computer. Harry - You might use computer modelling to get the best possible way of forging the steel, because forging is used for many critical components. The discs that go into jet aircraft which hold the blades, those are called critical components, that means that if they fail you might bring the aircraft down. You have to be very careful of how you forge it and get the right structure inside that disc in order to avoid that problem. And it's also not to say that computer models always work because the subject is incredibly complicated and we are continuously trying to make better and better methods of modelling materials, but we are not there yet. Jack - Nevertheless, this approach has enabled Harry and his team to develop some extremely effective new materials. He pointed out a sheet of dark grey metal, roughly the size of a computer monitor that's just 5 mm thick but still capable of stopping a bullet in its tracks. Surprisingly, it's also not a solid sheet; it's covered in a regular pattern of tiny oval-shaped holes and has perforations, and the material itself is a form of steel the team have engineered called super bainite. It's special because the production process means that the metal forms billions of tiny crystals, a tenth of the size found in normal steels and this is key to its strength. Harry - There are so many boundaries between crystals that if I add up the area of the boundaries it's about a hundred million square metres per cubic metre. That is a very very large density of boundaries between crystals! Now why is that important? Because the boundaries strengthen the material. So this has a strength of about two and a half gigapascals, which is like putting two and a half billion apples in one square metre - it's incredibly strong. When you make things strong they are not particularly tough, that means they can't absorb too much energy. So you know, if you fire a projectile at it, it will defeat the projectile but they'll be too many cracks. So what we do is we put systematic perforations inside the steel which have two purposes; one is that the edges of those holes, they help to deflect or destroy the projectile because they are sharp edges. 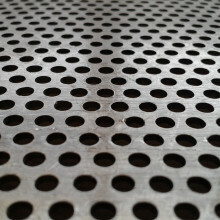 The second is that because these perforations are smooth, if a crack forms then it’s blunted by them. If you look at this object, it's had multiple hits and yet the whole piece of armour is still integral and, of course, it leads to a reduction in weight which is a good thing if it's on a vehicle. Jack - It may seem counterintuitive, but the perforations improve the performance of the material when hit, with a bonus of also making it lighter. The super bainite provides strength, the perforated design provide the toughness to prevent it cracking. In other words, it’s a material is designed that enhances the properties further than what the material can do alone. Harry then showed me how a change in design of the common steel beams we have in all our buildings could lead to them being built for better fire safety. The cross-section of a beam is what you would see if you were to take a slice anywhere along its length. It is this shape that his team have redesigned. Harry - Now buildings, the frames are made from beans and normally they're called ‘I’ beams because they're shaped like a capital i.
Jack - The things you see on a construction site, the cranes lifting into position, those sort of beams? Harry - Exactly. But notice this is not shaped like an ‘I’ because the web at the top is smaller than the web at the bottom. Jack - If you imagine a capital “I”, the webs of the beam are the flat lines that sit on the top and bottom. Usually they'd be the same size, but in Harry's design the top one is made smaller than the bottom. Harry - The important thing about this is that the top web is smaller than the lower web. And the reason is we wanted to actually put the floor in between these two, instead of on top. Jack - The Twin Towers? Harry - The Twin Towers, they collapsed almost after one hour. So you can remove the fire protection from this area where floor slots in and you save height. Jack - So it's integrated into one? The floor actually protects the steel from melting? Harry - Correct. And this new concept of Fire protection actually is effective. How can we create sustainable but efficient products? What else does the future hold for materials science? Well with a rising world population placing increasing pressure on our resources, a major priority is to produce materials sustainably and also make the most efficient use that we can of what we already have. Now this is called a circular economy, and it's a concept that Alysia Garmulewicz has been looking at in some detail. She is from the University of Santiago in Chile and is Director at Materiom, an open knowledge platform for making materials from locally abundant bio-based ingredients. But what actually is a circular economy as applies to materials? Alysia joined Chris Smith in the studio to give some examples. Alysia - It’s usually thought of in terms of two major cycles. One is the biological cycle, so on the one hand we’re looking at materials that can actually enter back into the biosphere and be returned and actually regenerated on the basis of natural systems. And then another cycle is technical materials, so those materials that don't very well go back into the biosphere but we need to then engineer ways to return those back into useful purposes for our human industries. So in terms of the material cycles it’s usually broken up into those two sections. Chris - So at the moment, for example, I get some oil out of the ground, I turn it into a plastic bag. This is a very bad example of a circular economy because it's a one-way street. I've made the bag, is gonna sit there in landfill for potentially thousands of years? Alysia - Precisely. Yes, so that's a good example of the linear economy that we have now and the problems underpinning it. Chris - So you're advocating some kind of rational design of something - a better bag if you like - that means that we start with a different starting material or we engineer in some kind of recyclability from the get-go? Alysia - Exactly. We need to think about regeneration as the kind of guiding principle and one of the major things that my work focuses on is reimagining where that takes place, the scope and scale. So one of the things that is currently in the discourse of the circular economy is the idea of cycling, that's kind of implicit in the concept. But what is a kind of next-generation, I think, of work in this area is looking at what appropriate scale can we make the materials and return them back. So if you look at natural ecosystems, you look at how materials, actual molecules get absorbed into the organisms that then build habitat etc. but that's usually at nested, quite local and regional scales in terms of the cycling. What we do now is we dig up minerals from mines or petrochemicals from large, large deposits and then create huge, global supply chains in order to actually transport those materials around the world. The problem is that you then have centralised material production and distributed waste. And when you think about that as an issue of trying to pipe that back into all that distributed bits of waste back into a centralised production system it's incredibly uneconomic and very difficult. So one of the ideas is decentralising that type of material supply chain into more nested nutrient networks. Chris - That's true of economies and industries all over the world, isn't it? Because I was shocked a few years ago when I learned that the prawns I cooked for dinner one evening had been caught on one side of the Atlantic, shipped all the way to Thailand, shelled on the ship, cooked out there and brought back for me to eat. So those prawns had travelled further in their lifetime than I have probably, around the planet, and you think the carbon cost of that. But it's not trivial then is it because the whole world economy is geared up around making stuff at scale and then moving round to an end-user. So what you're advocating is a massive, massive overhaul of how we make stuff and use stuff? Alysia - Precisely. And I think it's a really good analogy to look at food systems that there's really good logic for more regional local supplies for reasons and also energy. So the kind of renewable revolution that's happening right now is it's starting from the premise of what is around you, what makes sense to be adaptive in this place that we live in. And the next step that is materials, and you point out quite rightly that it's a huge revolution in the way things are done. However, there are seeds of change that are out there right now; for example in the digital fabrication space where fab-labs and makerspaces and local communities of production are popping up everywhere. That gives hope for a more decentralised or distributed manufacturing landscape that currently is in the wings, so to speak, but could be a harbinger for a greater future transformation in that sense. Chris - But I get what you're saying. The thing is that if you look at say computers, mobile devices, they’re all mass-manufactured in China and they're travelling enormous distances. Some of the materials travel enormous distances but they’re also being made where those materials are in abundance. Now we’re not just going to wean the entire world off overnight of having a laptop and an iPhone are we? So there are going to be some things that presumably are not amenable to doing this - there are going to have to be exceptions? Alysia - I think that's true and I think you have to look at the kind of volume of materials that we want to focus on in terms of making that change to begin with. 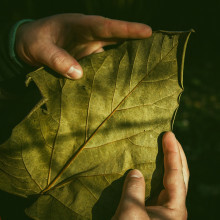 We focus a lot on plastics, we focus a lot on materials that can be sourced from abundant sources of nutrients from biomass so, for example, lignocellulosic materials that are the building blocks for trees and all plant matter basically, that’s highly distributed and abundant all over the world. As well as, for example, we’re doing a lot of work on making algae-based bioplastics. Agar is a biopolymer that you could make from algae but that is actually common to a phylum called red algae, which contains about over four thousand species that is highly distributed around the world. So the idea that you could actually make and fabricate functional plastics pretty much anywhere on the planet is the vision that we see as completely possible. The other aspect is that when you combine that with technology that’s highly participatory in terms of using green chemistry methods - that's low heat and low pressure - basically the plastics we're making you can make in your kitchen or at least in a small lab. That's the kind of technology that allows more people in more places to participate in this new materials economy. Chris - It just seems amazing that we spent all of our history scaling things up and working out how to make bigger things and get them to places faster, and now we’re bringing it all back to home and making it local again, making it artisan almost. It's extraordinary! Alysia - I think that an interesting trend. I think that on the one hand you have things that will be large in scale and then other things that will be small-scale, and it's more the question of what's the appropriate scale for the type of material and the type of production that we want. 51:28 - Why do socks get lost in the wash? Why are they so unhappy in monogamous relationships? 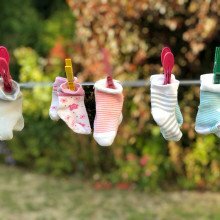 Why do socks get lost in the wash? Izzie - I can completely relate to Chani’s question. I’m particularly bad at losing socks. And even if a matching pair make it to the washing machine, I’m often only left with one after a spin. But WHY? Rob - Given that you start with four pairs, the first sock that the machine loses - let's say it's a red sock - is 100% certain to leave you with an odd sock. Now you have seven socks left, three pairs plus an odd red sock. The chance that the next sock you lose belongs to one of the remaining pairs is 6/7… Six socks out of seven are in a pair, which is about 85%. Izzie - So already, after two washes, there is an 85% chance that you have created two odd socks. And it goes on. Rob - After the third wash, with four of the six remaining socks still in a pair, there is a 4/6, or two thirds, chance that the third lost sock will also create an odd sock. In other words, after three washes, there's a higher than 50% chance that you'll now have three odd socks. And the more different pairs of socks you start with, the higher the odds of producing odd socks becomes. Rob - Always buy socks that are one colour. You'll still lose socks at the same rate, but this time you won't notice it's happening! Izzie - Thanks Rob, next time we’re digging for an answer to Aidan’s glowing question. Aidan - Consuming orange carrots in high excess can turn your skin orange, because of the beta-carotene. What about purple carrots? Can you melt a potato? Why is blu tack sticky? Next Why do socks disappear in the wash?